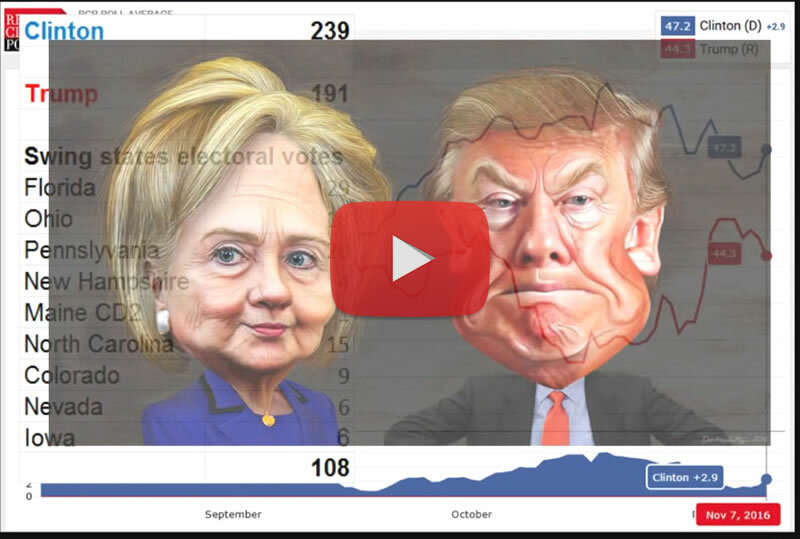 US Presidential Election Betting Markets Odds Now Forecast Trump Could WIN - BrExit Factor! Observing extreme volatility on Election night as we countdown to the critical too close to call Florida result! For instance the betting markets an hour before the US polls closed had Trump trading at 6.6 - That's at about 11pm UK Time. Then by 1am the betting market was virtually discounting a Trump election win and the odds for Trump extended to a high of 15! As illustrated by the 1am price of 12 which translates into a £100 bet converting into a £1,100 profit! Against a £100 bet for Hillary converting into a £10 profit! Whilst the price for 2am was 5.4. And the last price is 3.8 - Trump appears to be marching towards VICTORY AS FORECAST! So much for the likes of Nate Silver, the New York Times and the hundreds of clueless academics and professors who I am going to enjoy tearing to pieces in a series of articles. But first - FLORIDA BECKONS! Meanwhile the wall street backers of Hillary Clinton are marking down stock futures with the Dow trading 300 points lower as I write.